Robert Shiller produces the well known cyclically smoothed price/earnings series that featured in his book Irrational Exuberance (seem to recall he was right about that). He also keeps the data up to date here. The latest point (my update for September) produces an adjusted p/e of 16. Prices have truly taken a hammering from the very great heights of 1999/2000. 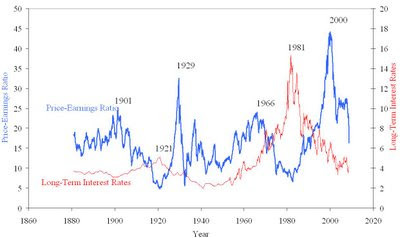 Yet the real "generational" buying opportunities of 1920 (p/e circa 5), 1932 (p/e circa 6), 1949 (p/e circa 9) and 1982 (p/e circa 7) were at altogether lower levels. A price/earnings ratio of 16ish is, in fact, the mean average of the series. Which suggests the recent track of p/e levels is probably being a little over weighted by today's cheerleaders. NB: All data bar the p/e for September 2008 from Robert Shiller's website. NB1: The FT's John Authers did a fine piece on this 2 days ago. Video here.